As you may recall, for his fourth birthday, Bookworm1 requested a hippo party which required some creativity but we managed to pull off. Furthermore, what you are unaware of is the fact that my mom (aka, "Nana") recently went skydiving which has prompted a great deal of curiosity about jumping out of planes and using parachutes around these parts. 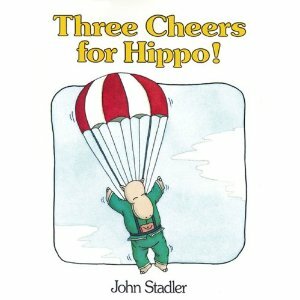 When Star Bright Books sent along their new catalog and I saw a picture of Three Cheers for Hippo! , I figured it was a safe bet that we would like it! I noted that it was an early reader and so I wasn't sure there would be much of a story. I was right AND wrong about this. On each page there is a short, simple sentence. There are also quote boxes over the characters - Hippo, Dog, Cat and Pig. It is a very easy read but it does tell an imaginative enough story if you piece it all together. Hippo gives sky diving lessons and Dog and Pig are very excited to give this a go! Cat is a little worried but Hippo constantly tells him, "Don't worry!" All three animals jump, with Hippo's assurances, but discover themselves over a swamp full of alligators! Here was the added benefit of this book, which really surprised me. Bookworm1 loved the story (that wasn't the surprise) so much that he wanted to read it all by himself! And so he did! He sounded out the words and read the story to me! Obviously my assumptions that he would love this book were spot on and we have enjoyed countless re-reads of this story. Sometimes I read it and sometimes he does but the story remains engaging to him. A surprise book but it ended up being lots of fun! As you may have guessed - "we" are animal lovers around here. 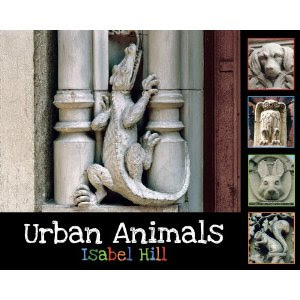 I also thought it would be fun to check out Urban Animals , by Isabel Hill. Most of this book is comprised of real photographs showing animals hidden away on buildings. The photographs were all taken in the Manhattan area and not only does the young reader learn to look for animals in unusual places, they can also learn about architecture. This book is simple, and yet complex. You can use it just for spotting animals on the buildings or you can learn architectural terms. The "story" of the book, if you will, is told in rhyme and is very curious and unique. I've never seen anything quite like it. We are grateful to Star Bright Books for allowing us to take a peek at these two treasures and would like to pass a recommendation of them off to you! Very cute...and a great way to introduce architecture! I didn't get past "My mom went skydiving." WOW!!! Okay, I've come back to finish reading these reviews, and both books sound great! I'm really intrigued by the second one. And yay for Bookworm1 reading to you! Annette - Yup! I think Urban Animals is an AWESOME way to introduce architecture. Being that we live in a small town, there's less to look at. =) But if we were to be wandering around a big city, this book would make looking at the buildings more enjoyable for sure.